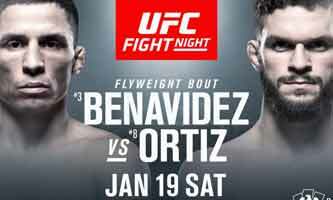 Review by AllTheBestFights.com: 2019-01-19, fight not so exciting between Joseph Benavidez and Dustin Ortiz 2: it gets two stars. Joseph Benavidez entered this fight with a professional record of 26-5-0 (62% finishing rate) and he is ranked as the No.4 flyweight in the world (currently the #1 in this division is Henry Cejudo). He fought twice last year losing to Sergio Pettis (Joseph Benavidez vs Sergio Pettis) and beating Alex Perez (Joseph Benavidez vs Alex Perez). His opponent, Dustin Ortiz, has a mma record of 19-7-0 (63% finishing rate) and he entered as the No.6 in the same weight class. He lost to Brandon Moreno in 2017 (Moreno vs Ortiz) but then he has won three consecutive fights defeating Matheus Nicolau Pereira in his last one (Dustin Ortiz vs Matheus Nicolau Pereira). In their previous bout, Benavidez had beat Ortiz via unanimous decision (November 22, 2014 – Joseph Benavidez vs Dustin Ortiz I); this second fight is on the undercard of Henry Cejudo vs TJ Dillashaw – UFC Fight Night 143 (also known as UFC on ESPN+ 1). Watch the video and rate this fight!